They are more alike than you might think at first glance! Given the chance, any kindergartener would say that! Ok, perhaps they wouldn’t say “what the world needs” but they surely would say “what I need” or “what my friends need” or “what my dog needs.” They are natural problem-finders, and problem-solvers! Like Edison, they are constantly observing, investigating, wondering, and asking questions. This, coupled with their imagination, and a rather intense desire to have things that do not yet exist, often leads them to a plethora of problem-finding. This car I just made is too long. We need a zip-line on the playground. Why don’t we have a container that holds all that stuff? They often also share Edison’s intense confidence, boundless energy, imagination, and love of tinkering. 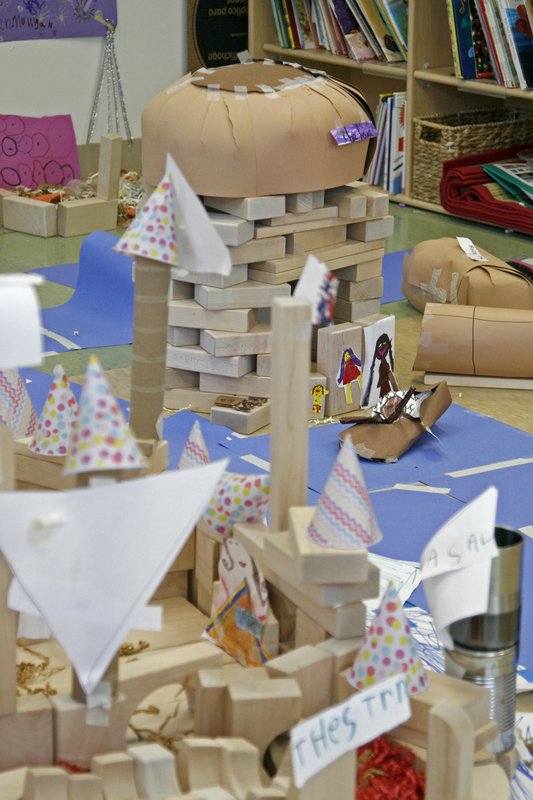 Given the opportunity, time, resources, and a little encouragement, they create many prototypes as they engage in focused and determined problem-solving. We might be inclined to relegate this to the “ah, isn’t that cute” category. While it is cute, it is so much more! It is sophisticated problem-finding and problem-solving. 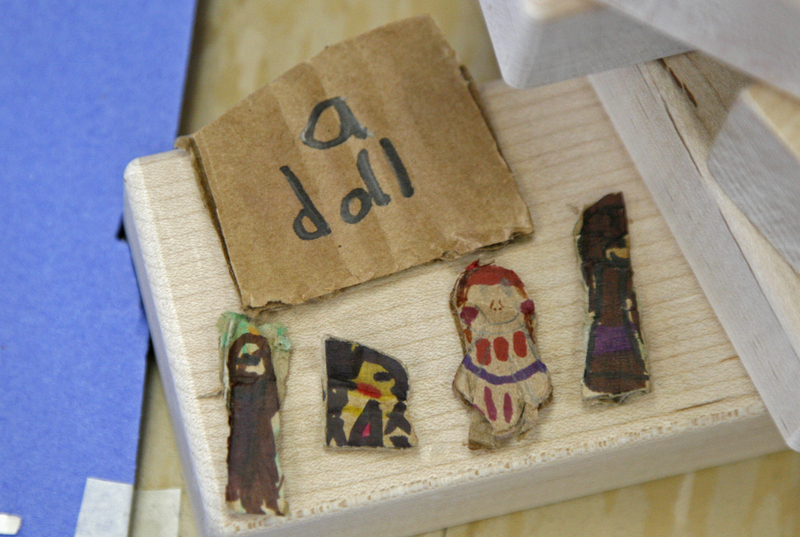 This student took her present knowledge – about cards, sticks, handles, tape, hands – and thought about it in a new way. She used that knowledge to envision something as yet non-existent – a card you can open without touching it. She then took the materials available to her, and used them in novel ways to solve her problem. 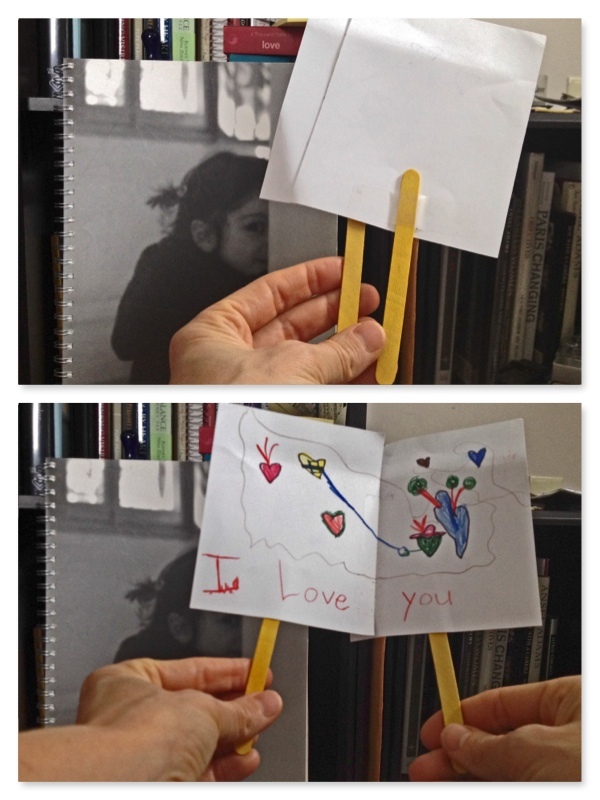 She created a card with handles. And, it can even be place in an envelope. 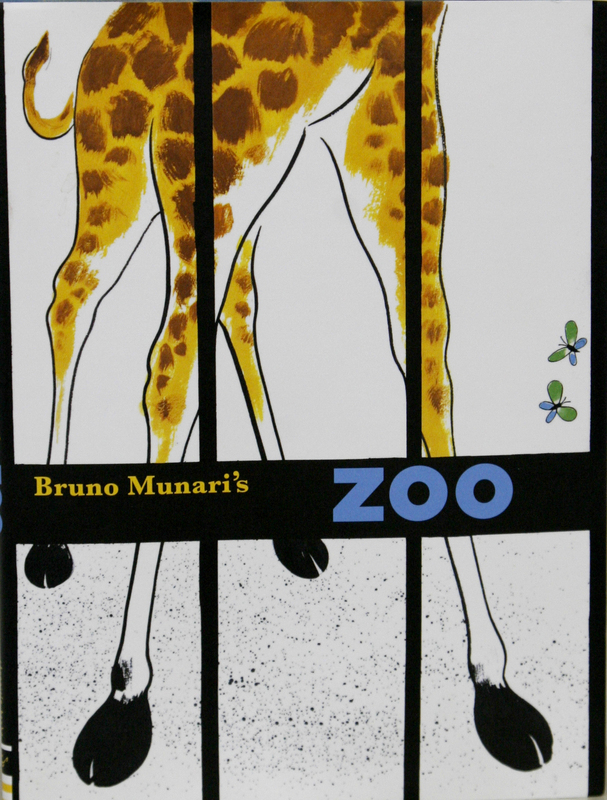 I discovered Bruno Munari while attending a conference for educators at the Eric Carle Museum in Massachusetts. 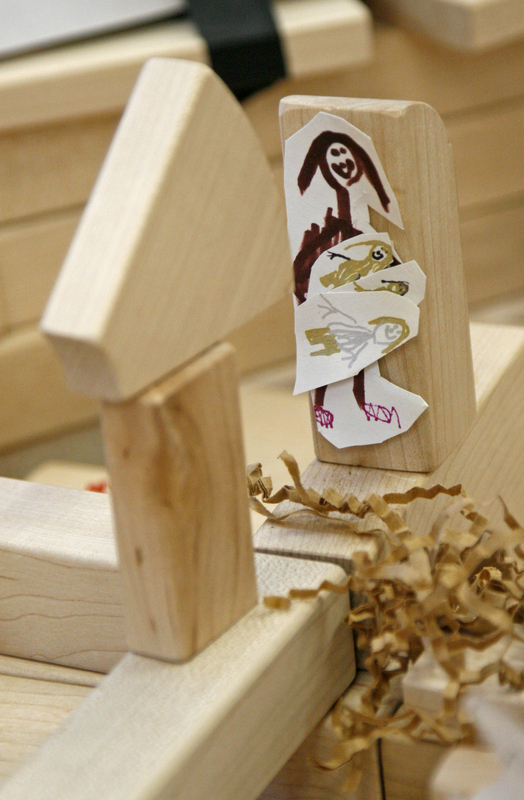 Munari – an Italian artist, designer and inventor, and writer of children’s books, – is loved by Reggio educators. I use Munari’s Zoo and Munari’s Machines in the classroom with great results! I enjoy using Munari’s Zoo at the beginning of the year. 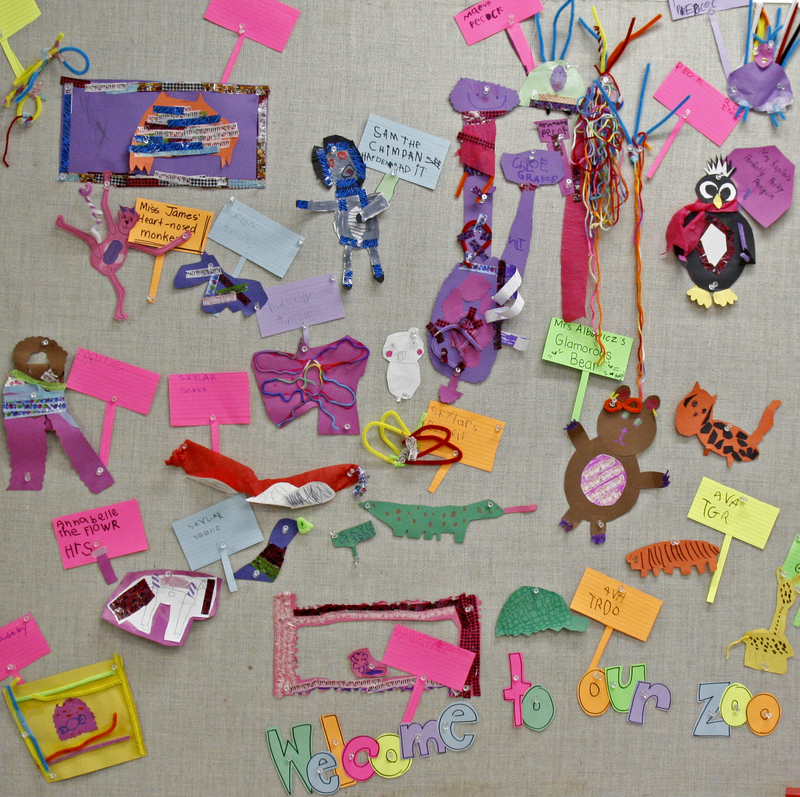 After a read aloud, we surround ourselves with paper, pencils, crayons, markers, scissors, tape, yarn, pipe cleaners, hole punches, and various other art supplies and tools – and set about making an animal to populate our classroom zoo (bulletin board). It’s a fabulous exercise. 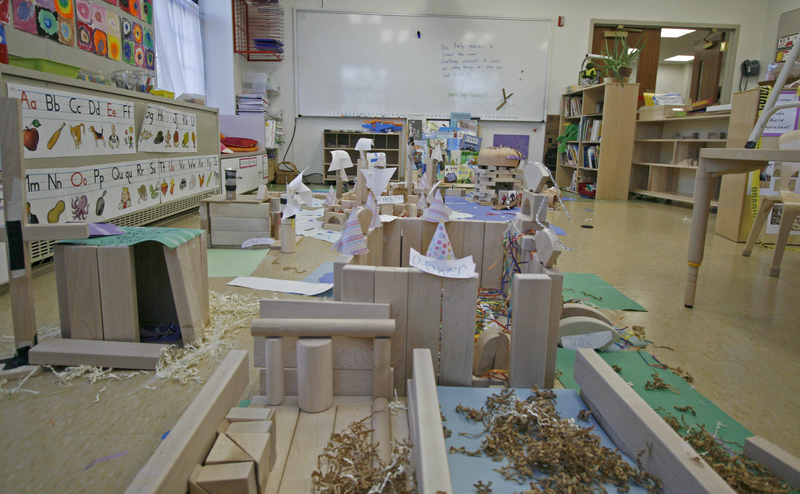 The students are engaged – working hard without feeling strain or pressure. The spirit in the room is light and joyous. Conversations abound between the students, and between students and teachers. It’s a great way to get to know each other and to do some authentic assessments. Are the students brave? Do they jump in, or hang back a bit? Do they have many ideas that they share and implement? Do they look to their friends or teachers for ideas? Do they need a little extra encouragement and love? Are they leaders – helping friends? How are their fine motor skills (holding pencil, scissor, manipulating tape, pipe cleaners, cutting, drawing)? Do they know the sounds letters make? Can they stretch out words? What do they hear as they stretch out the words? Do they have an efficient motor plan for their letters? Do they use upper case, lower case, or a combination of both? The challenge involved is positive and self-regulated. The students are intrinsically motivated to create, and caught up in the excitement of seeing their work displayed, even the most timid writers stretch out words to make their sign. 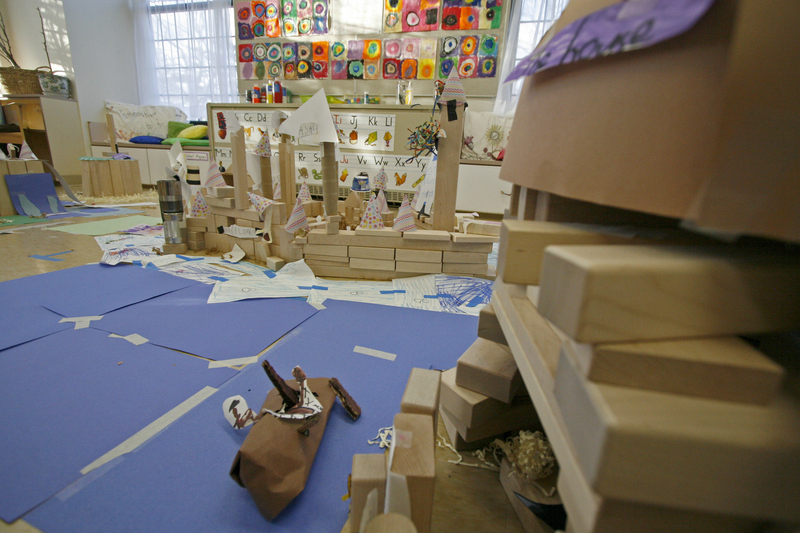 The open-ended nature of the assignment allows the children to self-differentiate. Some students make one animal, some make many. Some use materials they are familiar with, while others experiment with some of the less familiar materials. But, one way or another, everyone succeeds at the task. This project is an easy, and safe way, to give the students control over their work and learning, and therefore increase their sense of agency, early in the school year. My instructions are simply to make an animal, and a sign to accompany it. They decide if the animal will be real or imaginary. They determine the form, color, and size of their animal. They choose the materials they will use to create it. 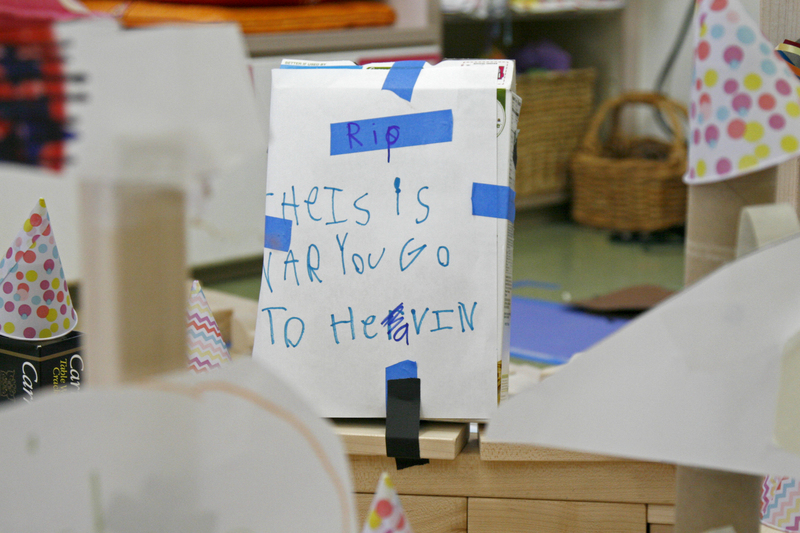 They decide what their sign will say, and write it (with as little or as much help as they need). Finally, once done, they choose where to place their animal on the board as we create our class zoo. And, very importantly, I do my best to limit my “interference” and simply listen, question and encourage. For instance, the animals at the top right are peacocks. One has to use their imagination and enter into the mind of the child – as best we can – to see how they are all wonderful representations of peacocks – although not ones we might have imagined. But, notice the color, the beginning structure, and the use of the yarn to represent all the color of the peacock feathers. I even purposefully limit the amount of help I give them as they write. 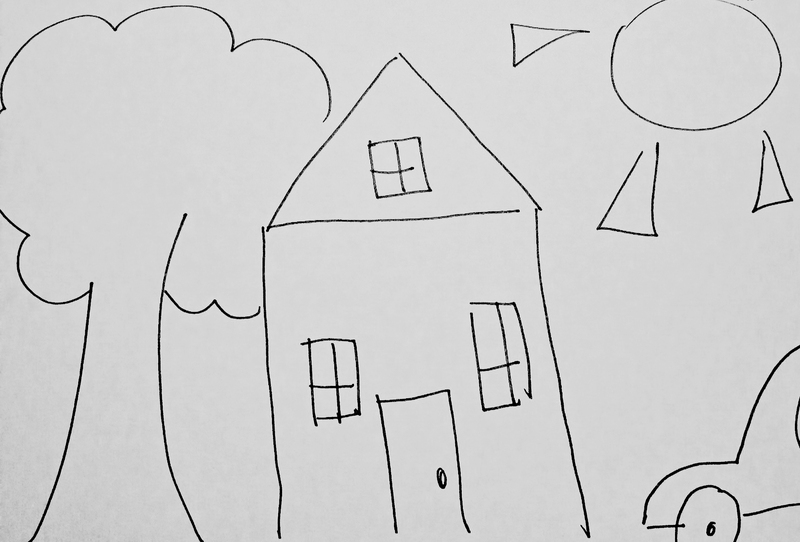 I try to help them hear the sounds in the words, and encourage them to represent each sound. But I resist my adult urge to “tell them” how to write it. By limiting my “help” I allow them to think, struggle, problem solve, experiment and come up with their own solutions. By doing so, we (they and I together) strengthen their skills, increase their ability to persevere, expand their vision of themselves and their abilities, and (hopefully) positively impact their future work and thought.